SAS FORKS™ and attachments are built to the rigorous specifications resulting in a tool tough enough to handle severe conditions and heavier loads, this gives operators performance, durability, and an extended useful life. The ultimate the goal of SAS is to eliminate down time. 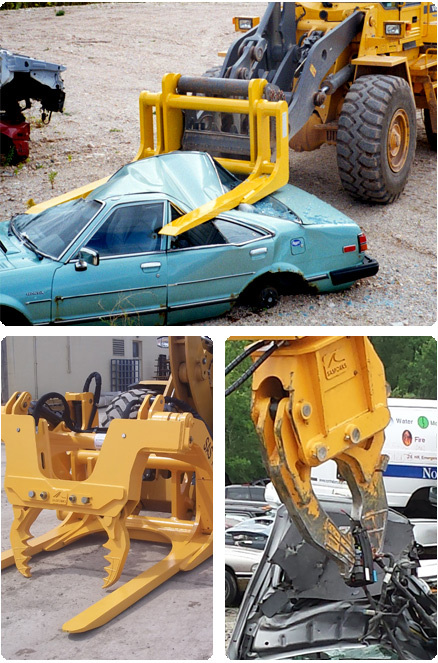 We specialize in manufacturing 6' to 18' fork assemblies for use in the auto salvage industry. Our extensive experience in the auto salvage market, where operators are especially hard on their equipment, has helped us develop insights into other industry segments which demand performance from their forks in the most extreme environments. SAS FORKS and attachments are manufactured to fit many types of equipment, including wheel loaders, excavators and forklifts (fork trucks). We engineer custom products for telehandlers, skid steers and backhoes. Products are delivered with a wide variety of functions. Fixed and adjustable widths of forks and carriages as well as the SAS Quick Coupler System for wheel loaders, for use in multiple material handling applications including rock quarries, oil fields, steel mills and defense applications. 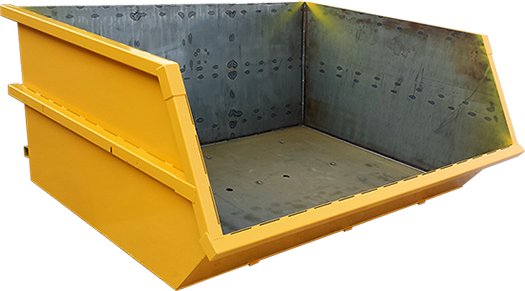 Use as collection bins for engines, transmissions, wheels, wire and or cores. Smaller sizes save space in the processing area on site. These SAS Dumpsters are perfect! Right now I'm driving my new L90H and simply quick coupled right to the SAS Dumpster and hauling aluminum wheels from my wheel break down area. These dumpsters are great for wire harnesses and aluminum radiators recycling collection. Works wonderful! I'm really happy with it! Find more customer reviews on each of our product pages. We're here to help you—contact SAS Forks today!